U.S. Attorney General Jeff Sessions condemns recent bomb threats against Jewish groups. 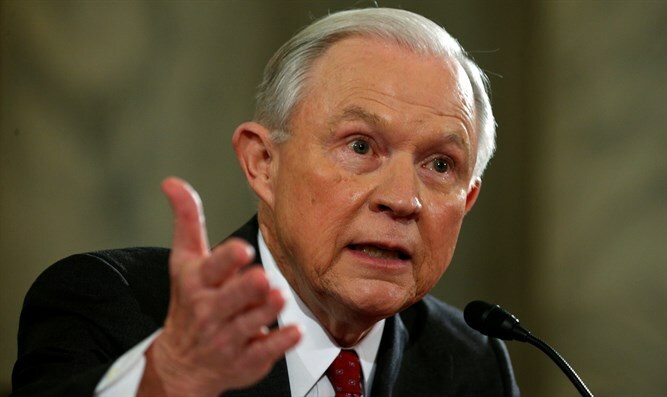 U.S. Attorney General Jeff Sessions said on Monday that recent bomb threats against Jewish groups are “unacceptable”. Speaking to reporters, Sessions called the threats a “very serious and destructive practice”. Earlier on Monday, at least 10 Jewish community centers and Jewish day schools across the United States received bomb threats, the fifth wave of such threats in less than two months. Paul Goldenberg, director of the Secure Community Network (SCN), told JTA shortly after reports of the bomb threats began coming in that his organization was working closely with the Department of Homeland Security and the FBI to identify the perpetrators and stop the threats. SCN is an affiliate of the Jewish Federations of North America that advises Jewish groups and institutions on security. Some 60 JCCs and Jewish schools have received nearly 70 bomb threats since Jan. 9, forcing the evacuation of hundreds, including preschool children, from the buildings. Two Jewish cemeteries have been vandalized in recent weeks. Nearly 200 headstones were knocked over in a Jewish cemetery in St. Louis. White House press secretary Sean Spicer told reporters on Monday that President Donald Trump is "deeply disappointed and concerned" by recent anti-Semitic incidents.